ZHOU Jingru, ZHAO Wanni, LIANG Jianfeng. Mechanism of Inhibition of Neuroblastoma Cell Proliferation by Elemene[J]. Journal of China Medical University, 2017, 46(12): 1062-1066. Abstract: Objective To investigate the effect of elemene and the mechanism of this effect on the proliferation of neuroblastoma.Methods We treated cultured SK-N-SH cells with elemene and used the MTT assay to determine the inhibition of cell proliferation. We used RT-qPCR and Western blotting to measure the effect of elemene on mRNA and protein expression, respectively, of repressor element-1 silencing transcription factor (REST) in SK-N-SH cells and evaluated the mRNA expression of CCND1 and CCNE1 in SK-N-SH cells by using RT-qPCR.Results Elemene significantly inhibited the proliferation of SK-N-SH cells in a dose-and time-dependent manner (P=0.001 16). 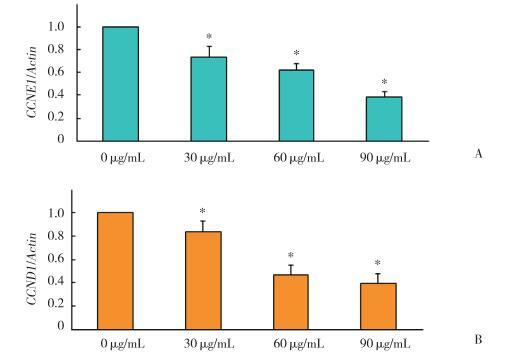 Moreover, the mRNA (P=0.000 38) and protein (P=0.003 39) expression of REST were markedly suppressed by elemene. 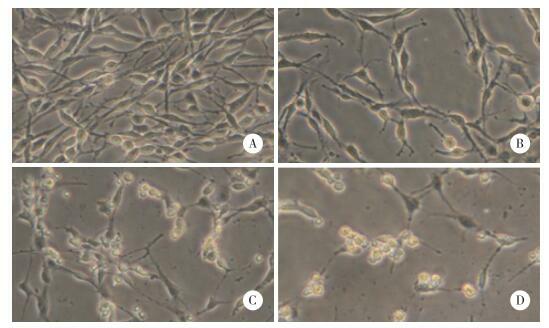 Furthermore, elemene significantly reduced the mRNA expression of CCND1 (P=0.001 91) and CCNE1 (P=0.000 15), which are related to the cell cycle.Conclusion Elemene significantly suppressed the proliferation of neuroblastoma cells through the reduction of REST, CCND1, and CCNE1.